I was called a wad by several people at the crag yesterday, which was weird because all I did was fall off a 7c (Fòllame at Espedelles Extension in Margalef). Perspectives are really odd. I suppose if I wasn’t me but I was looking at me I might be quite impressed, but since I am me and I know me, I can think of a million explanations/excuses for why I almost flashed a 7c, none of which give me credit for just being a half decent climber. No I’m not strong, it’s luck and good beta honestly. A cloud went past when I climbed so I had good conditions. However, before the 7c, I tried a 7a+ (next to it), which I fell off way more times and felt waaay harder. Sure the 7c was steeper and would require more strength and endurance but the 7a+ had nasty little pockets which I could barely hold on to. In terms of actual difficulty I definitely found the 7a+ harder. People often joke about the grades being backwards. Maybe they aren’t backwards but they don’t exactly feel very linear either. 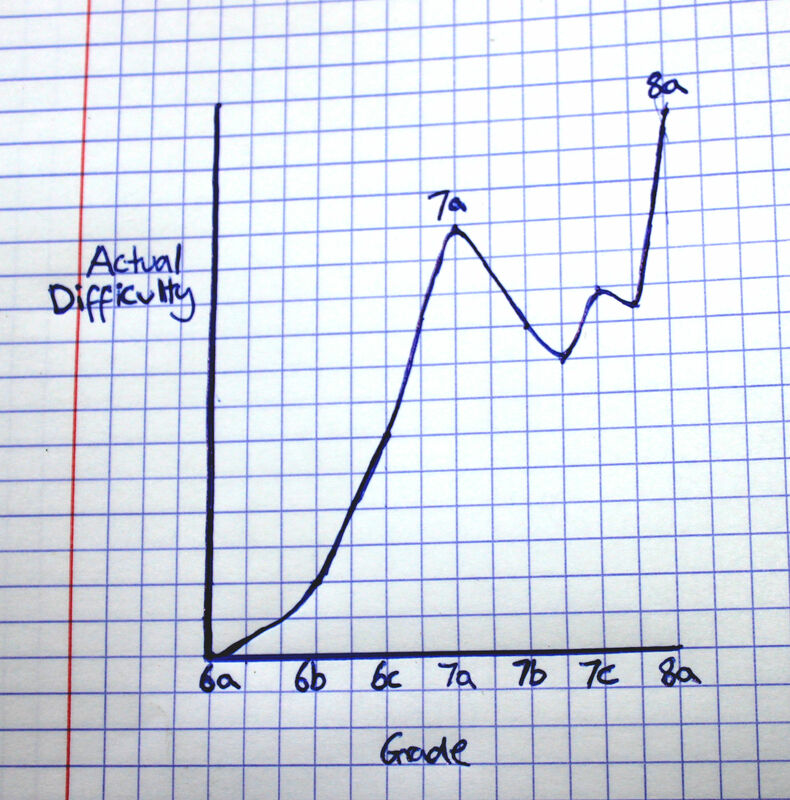 The grades become steadily more difficult up to 7a, where they peak. 7bs are a little easier and 7b+s easier still (I climbed this grade before 7b). 7cs can be a bit tricky but 7c+s are relatively ok, and 8a is actually quite hard (benchmark grade like 7a). Therefore if you’re struggling to break away from the 7a plateau (I was stuck on this grade for ages – it felt so difficult I rarely tried anything harder), I would advise getting on some 7b+s instead! That’s a pretty accurate graph!